Blek Le Rat knew that he did not want to merely copy the New York “Wild Style” which influenced so many other European writers. Inspired by the Situationists and punk rock he began invading the streets of Paris with his signature stenciled rats in 1981. Blek has inspired and influenced artists throughout the world and introduced the concept stenciling large scale images of people. In 1994 after a three-year court battle and the threat of years in jail, Blek was forced to give up his work with stencils and turned to postering. 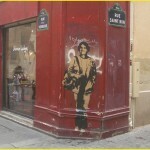 Most recently Blek has become a media sensation in France through his campaign to make the country remember journalist Florence Aubenas who was kidnapped on January 5, 2005 in Iraq. 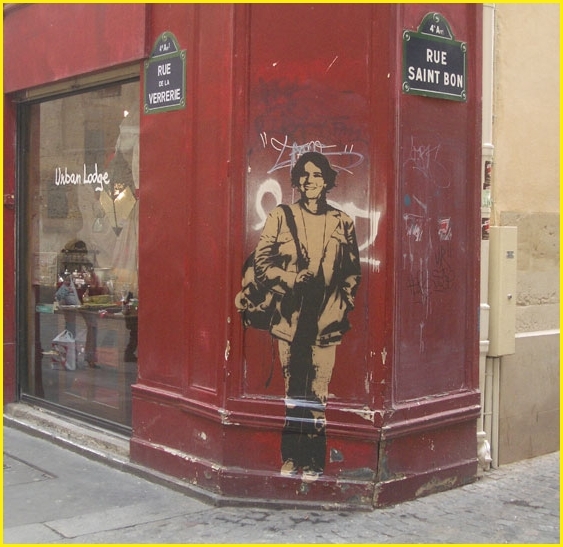 During her incarceration, Blek put up life-size images of Florence throughout Paris in the places she had traveled in during her former daily life. Florence was released on the 11th of June and met Blek on national television. Blek is a father (his wife and son regularly participate in his night-time raids) and working architect (none of his clients have a clue as to his nocturnal activities). We traveled 400km from Paris to the Bagnac castle near Poitiers (where Blek has been covertly stenciling for twenty years) to meet up with Blek and his family. See http://blekmyvibe.free.fr for more images of his work.